Do participate in a wonderful Giveaway at Alive n Kicking Blog By Shilpa Bindlish . I have been reading her reviews quite often . There will be 3 winners who will be randomly selected on the basis of their quality of participation and consistent effort. Each of the winners will receive a combo pack of 3 luxurious soaps. 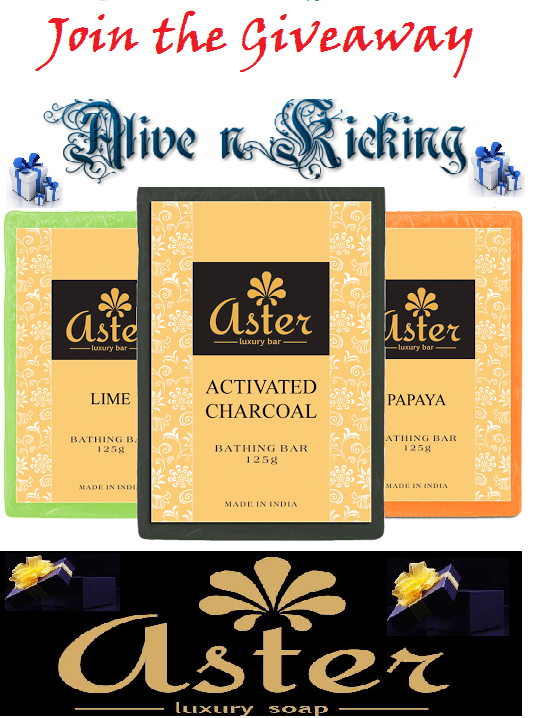 Follow Alive n Kicking and Aster Luxury Soaps on Facebook. Follow ShilpaBindlish and Aster Luxury Soaps on Twitter. Follow ShilpaBindlish on Instagram here. Follow ShilpaBindlish on Pinterest here and also Aster Luxury Soaps. Share the giveaway post on your facebook wall, Retweet it on Twitter and Repost on Instagram. Don’t forget to tag both pages and your friends in every share to make your entry count. Subscribe to her blog via email and verify your subscription by clicking on the link which you will get in your mail. Giveaway is valid for all male and female residents of India above the age of 18. It starts today on 23 Sept,2015 and ends on 15 Oct,2015. So its very simple to follow these rules and participate in the Giveaway .